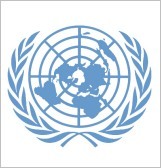 In 2007, the UN General Assembly established the "International Day of Non-Violence" and chosed October 2, which is Mahatma Gandhi's birthday. 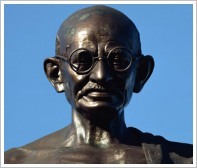 In order to celebrate the 5th anniversary, on 24th of October, a bust of Mahatma Gandhi (1869 - 1948) was unveiled at the Supreme Council for Culture in Cairo. Made by renowned Indian sculptor Ram Sutar, the bust has been gifted by Indian Council for Cultural Relations (ICCR) to the government and people of the Egypt in recognition of their peaceful pro-democracy revolution that adopted Gandhi's ideals and philosophy. At the same time, a booklet on Gandhi was issued entitled: “Gandhi, his life and his messages”. The book describes Gandhi’s journey through life and contains his most famous quotes. Gandhi's philosophy of non-violence and civil disobedience brought the British colonial rule in India to an end. The 61-year-old Alan Billis had been diagnosed with terminal lung cancer when he volunteered for the TV experiment. After his death in January 2011, the scientists turned his body into a mummy using the techniques which the ancient Egyptians used on Tutankhamun 3,000 years ago. They removed Billis' internal organs with the exception of heart and brain. They left his brain because they learned that around half of the 18th Dynasty royal mummies retained their brains - against the traditional wisdom that the Egyptians removed it through the nose. After the removal of the organs, the researchers immersed the corpse in a salt bath for more than a month to draw out the water and wrapped it in linen protecting it from light and insects. After three months of drying, the mummification process was complete. The documentary "Mummifying Alan: Egypt's Last Secret" will show this process step by step. It will be aired on Monday, 24th of October, 9 p.m. on Britain's Channel 4 television. P. Oxy. III 466 doesn't mean anything to you? 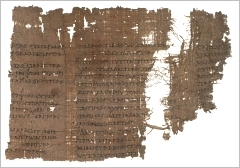 That's the term for Papyrus Oxyrhynchus III 466, a Greek papyrus fragment dating back to the 2nd century A.D., found south-west of Cairo in the 19th century, containing the oldest sporting instructions in the world, in particular wrestling. Wrestling was already featured at the ancient Greek Olympic Games. The papyrus describes step-by-step instructions on wrestling techniques in three columns each linked with the challenge "Fight it out". Today, a reproduction of the about 20 cm wide papyrus was presented to the National Wrestling Hall of Fame in Stillwater, Oklahoma. The original document will stay in Columbia’s Butler Library in the rare books/artefacts collection. 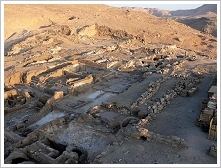 Since February 2004, the Egyptological Institute of the LMU Munich carries out the excavation and exploration of Deir el-Bachit, the heretofore largest known monastery complex at Western Thebes dating back to 5th to 8th/9th century AD. 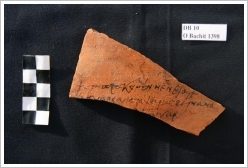 In the immediate vicinity of the complex, which is situated on the crest of a hill at Dra Abu el Naga, 175 ostraca were found recently. 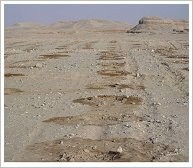 They suggest the conclusion that the well-preserved monastery of Deir el-Bachit is identical to the Paulos Monastery, which is mentioned in ancient texts but couldn't be located yet. Today, well-known Bollywood actor John Abraham confessed in an interview with the third biggest English-speaking Indian newspaper that he loves to roam around Egypt, the "wonderland of the Pharaoh rulers", after exhausting shoots. Did you know that sights in Egypt have been chosen for a couple of songs in Bollywood movies? Very famous: the Song "Suraj Hua Madham" from the Blockbuster "Kabhi Khushi Kabhi Gham" (Sometimes happy, sometimes sad, 2001) starring Shah Rukh Khan and Kajol in front of the Pyramids in Giza and in the White Desert. Also in front of the Pyramids, parts of lesser known songs were shot: "Ajooba" (from the movie "Jeans", 1998) starring the former Miss World Aishwarya Rai and "Teri ore"(from the movie "Singh Is Kinng", <no write errror!>, 2008) featuring Akshay Kumar. In the latter movie there is even another song - "Jee karda" - starring the Temples of Luxor's Westbank and Karnak! Under the Sun is a modern take on the historic art of Bedouin storytelling. A story within a story, told through an emotional journey of dance. The story is told through the eyes of a Bedouin girl, who discovers her talent to dance and her destiny to explore Cairo. Aisha was brought up in the Sinai desert, living life under the sun with her Bedouin tribe. One day her simple and peaceful life was suddenly turned upside-down with a vivid dream; a dream that would challenge her traditional values and give her the desire to leave her rural life and head for the big city - Cairo. Travelling to Cairo brings Aisha unexpected adventures. The Arabian Dance Theatre show presents a synergy of Arabic roots and folk movement with contemporary dance. Expect to see Bedouin, Arabic Folk, Oriental and Modern Arabic dance all in one show. Leeds (Seven Arts Centre, 11 Nov 2011, 8 - 10 pm). Today, the five-strong Nobel Committee announced its decision for the winner of the Nobel Peace Prize 2011 and set a special example thereby: This year's prize is to be divided in three equal parts between three African women "for their non-violent struggle for the safety of women and for women's rights to full participation in peace-building work": Africa’s first democratically elected female president Ellen Johnson Sirleaf (Liberia), peace activist Leymah Gbowee (Liberia) and human rights activist Tawakkul Karman (Yemen). The committee pointed out that it's impossible to achieve democracy and lasting peace in the world without the involvement of women. 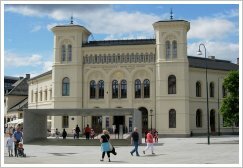 The Nobel Peace Prize is annually awarded since 1901 and includes prize money of 1.5 million US Dollar. 241 valid candidates of which 53 are organisations have been nominated for this year's award. It is said that Wael Ghonim as well as Egypt's April 6 Youth Movement were among them. Maybe they were not because the annual deadline is 1st of February - nominations after that date will be taken into consideration for the coming year. Anyway, even Mahatma Gandhi never received the quite controversial prize - inspite of numerous nominations. Important: New Mobile Phone Numbers for Egypt! For the next four months , you can call using either the old number or the amended one. Egypt had 76.43 million mobile users as of June, up 30 per cent on the year before. 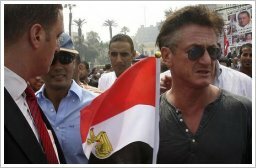 Sean Penn criticized the Bush administration for its "deconstruction of civil liberties" and for its policy concerning the Middle East. He is member of „Not in our Name“ (NION), a movement against war and police state restrictions, and supporter of Sea Shepherd, a non-profit marine conservation organisation. World's population grows phenomenally whilst arable land concurrently decreases by 10 million ha annually due to erosion and desertification. Solutions are needed quickly (we already covered an interesting project on 31/08/11). 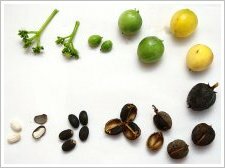 Researchers of the German University of Hohenheim build on a special nut: Jatropha curcas, also called Purging Nut. They sowed the seeds at a pilot plantation at the gates of Luxor and irrigated it by sewages. 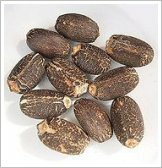 Jatropha curcas is a very robust, frugal, and resistant to diseases succulent plant, which is able to survive up to two years of aridity and not eaten by animals due to its poisonous sap. 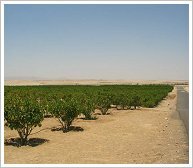 It's an ideal plant to green wastelands and eroded farmlands or to protect other plantations by raising hedges. The nut contains 27 - 40 % oil that can be processed to produce a high-quality biodiesel fuel, fuel for generators and lamps or candles and soaps. The peelings are usable for fertilising. The oilcake for which the researchers elaborated a patented detoxication procedure contains more protein than soya. Hence, it's a perfect fodder - without straining nature like the soya croplands on behalf of which rain forests were cut down.